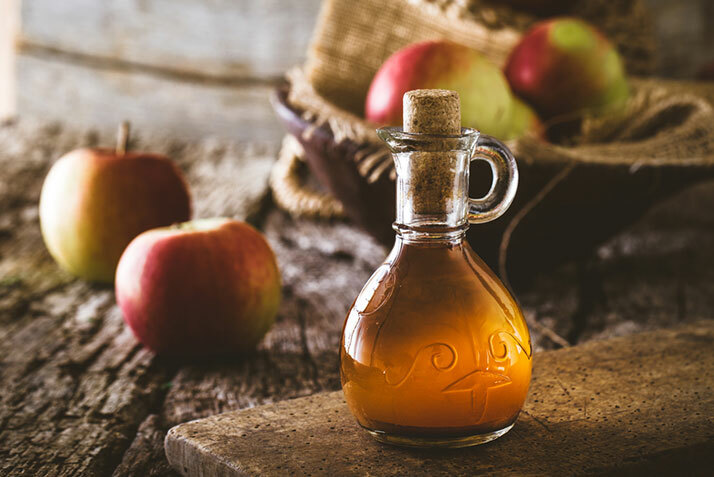 Apple cider vinegar (ACV) is a marvelous cleaner that's fairly inexpensive and provides a natural alternative to commercial cleaners for use in the home. ACV is non-toxic, biodegradable, and it is ideal for removing bacteria, mineral deposits and dirt. Kill germs and remove odors from laundry by adding one cup of ACV to each laundry load. Keep your washing machine sparkling clean by adding two cups of ACV and running an empty washer through a laundry cycle. Mix a solution containing 50 percent water to 50 percent ACV. Use it for streak free windows and cleaning walls. Scrape off the bulk of wax spilled on a coffee table, and remove the last of the wax residue with diluted ACV. Use full strength ACV to remove water stains from coffee tables. Add vinegar to carpet steamers to improve cleaning. Mix the vinegar with 2 T of salt to treat individual carpet stains. Mixing equal parts of ACV with water creates an excellent fertilizer for vegetable and flower gardens. Using ACV, full strength, in garden areas that are prone to weeds helps to kill top growth and may reduce weed growth all together. Fixing clogged drains is easy. Simply add ½ c baking soda into the drain, then, pour a cup of vinegar into the drain. Next, add one cup of very hot water into the drain. The mixture will immediately begin to bubble, fizz and foam. Let the solution work its magic for 15 minutes and flush with hot water. Vinegar can be used full strength or diluted with water to kill mildew on walls, tiles and sinks. Adding ¼ c of ACV to the wash cycle of your dishwasher is a good way to remove tough stains from wine glasses and coffee cups. Mixing equal amounts of water and vinegar together makes a mild cleaning solution that won't damage kitchen surfaces. It is ideal for scouring stovetops, walls, microwaves, refrigerators and countertops. Adding about a ½ c of vinegar to the wash cycle of a dishwasher deodorizes and removes stains from inside the dishwasher.